Offer woodpeckers and flickers a tasty treat in your garden with the Coveside Woodpecker Suet Feeder with Tail Prop. The 0.5" x 0.5" squares on the black, vinyl coated screens offer plenty of places for birds to cling. The eastern pine sides, base, and roof add a solid frame to the suet cage, while the wooden tail prop aids the woodpeckers in keeping their balance as they feed. Lift the lid of this item and insert up to two standard suet cakes, for the delight of your birds. For more versatility and to attract different birds, fill the item with large chunks corn bread or a seed cake. Use the attached fabric hanger to hang this item from a hook or bracket, for versatility in placement. The pine construction will last for several seasons, aging to a natural gray with exposure to the elements. 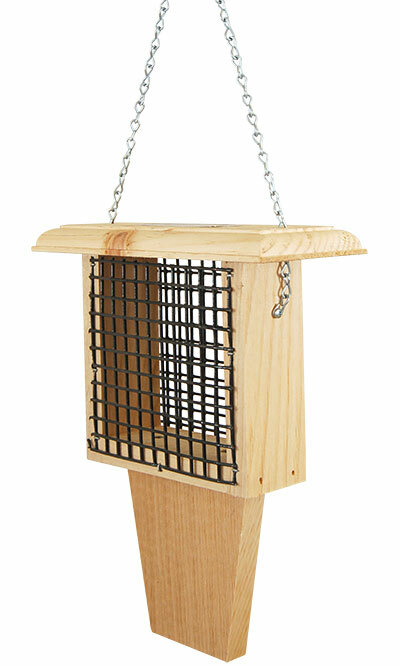 Invite different birds to dine in your sanctuary with this Woodpecker Suet Feeder with Tail Prop. Made in the USA.